The Sims 3 collecting is quite easy if your Sim has the “Collection Helper” from the Lifetime Rewards. To find space rocks with this helper, turn it on to find “Rocks and Gems.” When it is on, pull up the map of the town in map view and it will show the locations of where all of the rocks are in town. 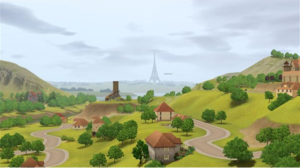 When you go to the location of where the space rocks in The Sims 3 are at, they will glow with a light making it easy for you to spot them. If your Sim doesn’t have the Collection Helper to find the space rocks, they could use a telescope and may spot a meteor falling which will mark the position on the map. Or your Sim could always just run around until they find some rocks, though the Collection Helper would be much more helpful (and faster). After your Sim has found a space rock, they can then choose to “Analyze” the rock to determine what kind of space rock it is as well as how much it is worth. The rocks may be worth more or less than the first appraisal of the rock. Once your Sim finds half of the rocks, they can find the other half easier. Once your Sim finds all of the different types of space rocks, they will be able to find the more expensive ones more often. If you have "The Sims 3: Ambitions" expansion pack installed, your Sim has a very small chance to be struck by a meteor and killed. You will be given a warning to move out of the way, but if your Sim doesn’t move fast enough, they will be killed by the meteor! If they do move fast enough, they can collect one gigantic Sims 3 space rock and also several large rocks from the crash site. If you have "The Sims 3: World Adventures" expansion pack installed, and your Sim has a high enough of the Martial Arts skill, your Sim can use rocks on the board to break it and reveal random gems. Space rocks can also sometimes reveal the very rare Tiberium which also has a unique cut called a “Spiral Cut” and it glows in the dark. It is not to be kept in a Sim’s inventory though as it will make the Sim carrying it have a negative moodlet from feeling nauseous.